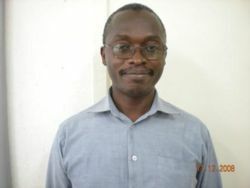 Hello, all members of wikieducator.org family, my name is Samuel Kizito sempiri. I have worked as the head of department 'Econmics. Head of department ICT, and incharge of the the school computer club. I particularly enjoy working with computers and have been interacting with computers since 1995.My contact address is skizito99@yahoo.co.uk for easy contact. I hope to Interact with as many members of the club as possible. My institution is Gayaza high School, a girls boarding secondary/high school having students between the age of 13years- 18 years of age. This is a school in uganda, one of the very first schools to embrace computers an pedagogical tools and computer education in the syllabus. Visit the school at http://www.gayazahs.sc.ug. I have great expectations out of this workshop; I hope to meet new friends face to face and on line. I hope to acquire new skills designing and publishing. I hope to get access to more content on the Internet. I hope to share my experience with new colleagues. This page was last modified on 2 December 2009, at 14:28.